Today Facebook added a new sharing feature in the form of a send button which will replace the previous "Email to a Friend" functionality. The new Send button works similarly to the Like button - whenever a user clicks one a small Facebook popup window will appear allowing the user to share a page to their Facebook friends, Groups or by email. 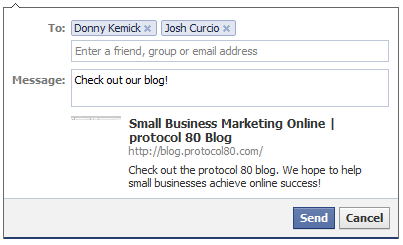 One important thing to note about Facebook's Send option is that sends will count towards a page's like total. For instance, if you put a Facebook share widget on one of your website's pages the Like total will represent not just the number of people that clicked the Like button but also the number of shares, comments and Facebook inbox messages containing a particular page's web address. And while you're here why not test out the Send button below? Let your friends and associates know about all of the Facebook Sendification they're missing out on!